It’s generally accepted that drivers, especially good ones, have their pick of opportunities. The implication for carriers is that they are constantly competing to get drivers to choose them. Depending on the carrier, 75% of all candidates interact with more than one carrier at a time. Carriers invest enormous amounts of time and money to get drivers to raise their hands and indicate some level of interest. Carriers spend money on ads, emails, PPC campaigns, etc. The cost is between $20/application and $400/hired driver, depending on what study or estimate you believe. Some carriers are paying third-party recruiters between $1,000 and $2000 per hire. But what we see in our clients is that a lot of drivers have indicated interest (by submitting an app, visiting a landing page, etc. ), but they cannot connect with a recruiter in a timely manner. The current process involves spending a lot of money to get drivers’ attention with no mechanism in place to speed up recruiter response times, effectively wasting the time and money spent capturing the drivers’ attention. The driver submits an application, and several hours, a day, or even more time passes. A recruiter calls, but the driver isn’t available, so the recruiter leaves a voicemail. More time passes. If a driver is really interested they will call back, but they often have to leave a return voicemail. The process repeats itself, with once-interested candidates dropping out with each loop. The problem is exacerbated by applications submitted after hours or on weekends, which occurs between 35% and 40% of the time for most clients. When a driver submits an app, an invisible time clock starts running. By two to four hours later, the driver has moved on to something else and become unavailable. It’s a very narrow window of availability, measured in minutes, not hours. Getting back in touch with the driver 30 minutes later can be as bad as getting back in touch five hours later. If contact isn’t made in real-time, the odds of conversion immediately go down. We think the solution is simple: connect with the driver in real time, not hours or days later. We understand that simple doesn’t mean easy—it’s hard to do, but the benefits are huge. When drivers who are reached within minutes, the percentage that moves forward in the hiring process jumps by around two-thirds. For example, take the following scenario. A driver applies at 10:00 on a Saturday morning and gets a call at 10:03 from the recruiter assigned to them. Intuitively, the conversion rate for that driver will be much higher than that of a driver that gets the first call at 10:00 on a Monday morning. To move to a driver-centric mindset, carriers must manage the following issues. Carriers need to deal with coverage issues to ensure that interested drivers can always talk to someone if their assigned recruiter is unavailable, even for a few minutes. Most carriers are used to getting coverage if a recruiter will be out for an afternoon or a day, but they also need to be able to provide coverage if a recruiter is on a call for a few minutes. Carriers must have the technology to notify the right recruiter when good candidates apply, regardless of whether that recruiter is at their desk or on their phone. At Tenstreet, we offer the IA Now tool set to enable recruiters to stay in touch with drivers in real-time. IA Now has the ability to show custom thank-you pages to communicate more details and to encourage drivers to stick around a little longer, thus improving the odds they’ll be reachable. Real-time notifications and views for recruiters and assisters (a necessary role when providing consistent real-time coverage) are available in Xpress. It has the ability to send notifications to recruiters’ phones when they are away from their desks and gives them access to the real-time view via their phones. It also provides the ability to trigger notifications for app submissions and when a driver visits a landing page. A single “restart the process” click from a drip email can notify recruiters to make a call in real time. We have the tools carriers need to make real-time communication with applicants happen. The only barrier is carrier operations. The bottom line is that carriers can increase their hires without bumping their ad spending amounts. 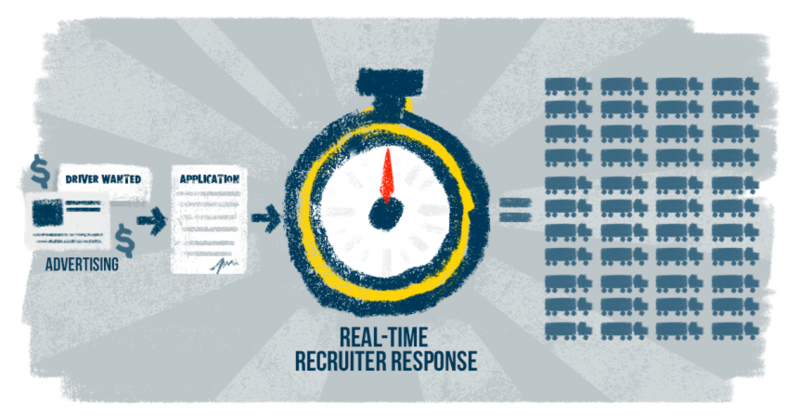 At Tenstreet, we are all about helping carriers respond to new applicants in real-time. Our solutions are integrated seamlessly into our software platform, delivering a simple and powerful way to manage your team and process. Schedule a consultation today to learn more about how we can help you maximize your recruiting efforts. Looking at the Online Application and expense that goes along with it. Hi Katie! Thank you for writing in, a member of our team will be contacting you shortly!